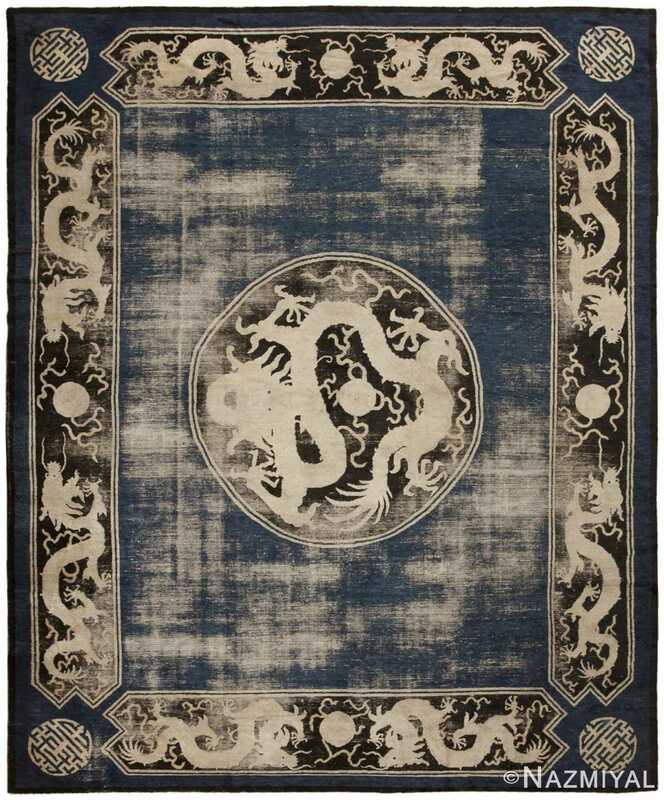 Crafted in Ningsia, this early 19th century dragon rug showcases nine beautifully detailed dragons accompanied by flaming pearls and auspicious shou characters. Antique Ningsia Rug, Origin: China, Circa: Late 18th / Early 19th Century – This stunning room-sized dragon carpet is a powerful work of art that pairs symbolic and mythological figures with a clean, formal composition. Grand banner-style borders with clever notched edges encircle the field and frame the auspicious Chinese shou-style insignias that decorate each corner. The classical round medallion is filled with an animated dragon that features five deeply hooked claws, a furcated tail and a serpentine body that spirals around the self-contained roundel. This dramatic focal figure is paired with eight other pearl-seeking serpents, which play off the numerology of China’s nine legendary dragons. From the carefully selected shou symbols to the positions of the pearl-facing creatures, this antique Ningsia dragon rug immortalizes cultural legends and traditions. Because of their fine attention to detail and incredible techniques, Ningxia rugs are one of the most sought after antique carpet. The rug is woven in a field of dark blue, a deep color already eye catching in itself. 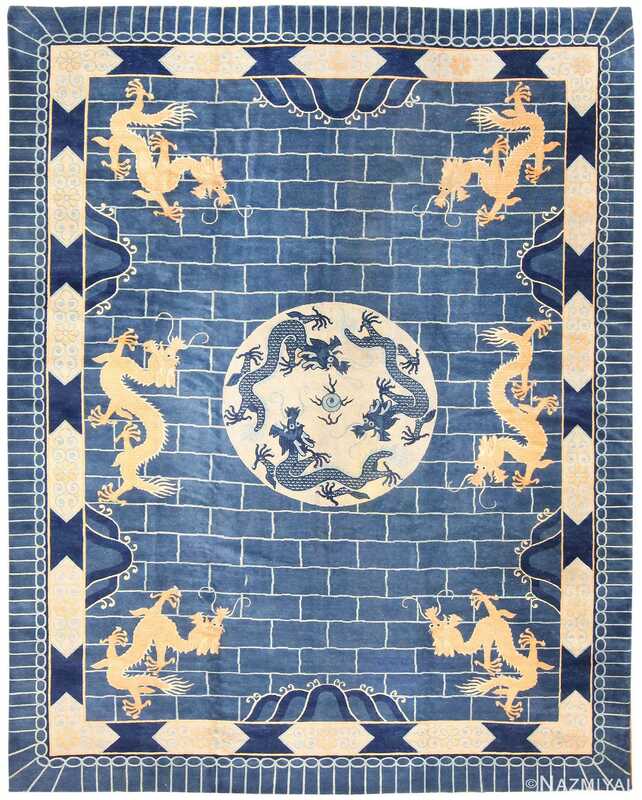 The black borders are woven with 8 dragons guarding the middle of the rug. 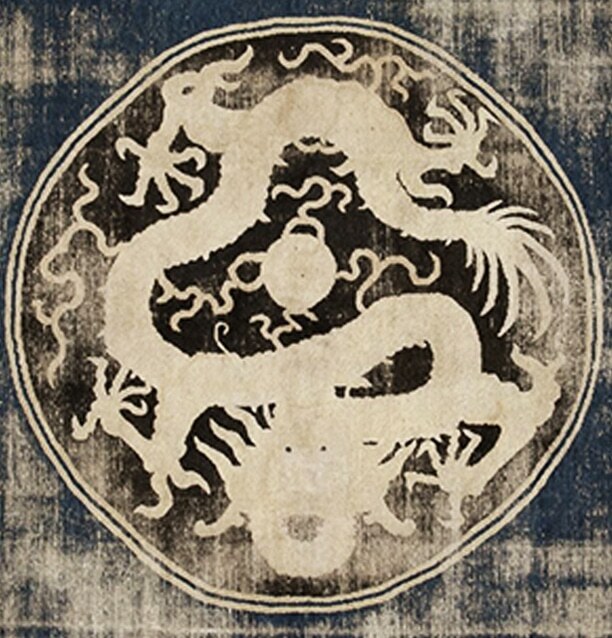 In the center is a large medallion and the ninth dragon, circling in his home. This fantastic 19th century Chinese Ningxia is a powerful symbolic work of art with beautiful mythological creatures. 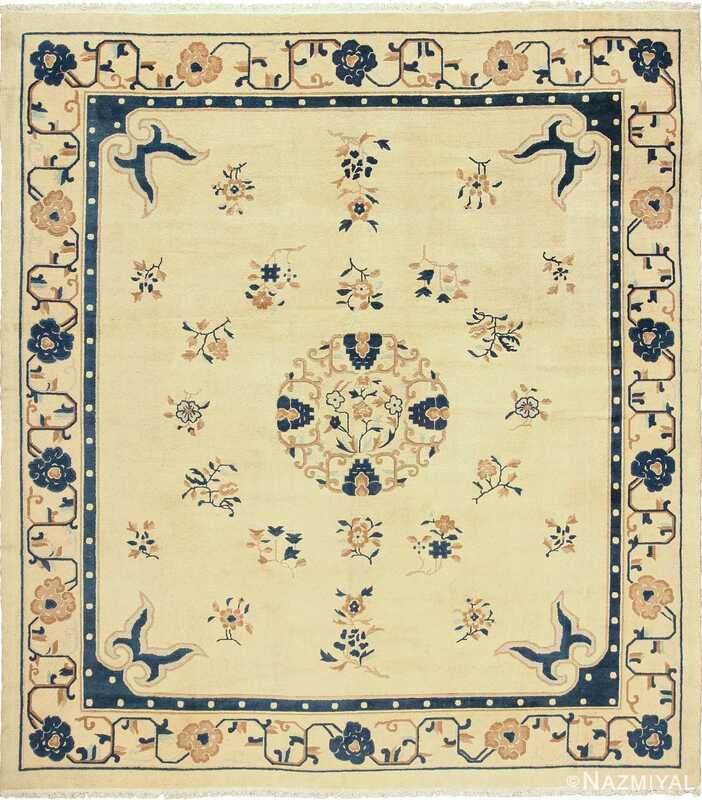 Clean lines, and a formal composition creates a grand rug for your home. The creatures face shimmering pearls and play off the Chinese myth of the 9 dragons. 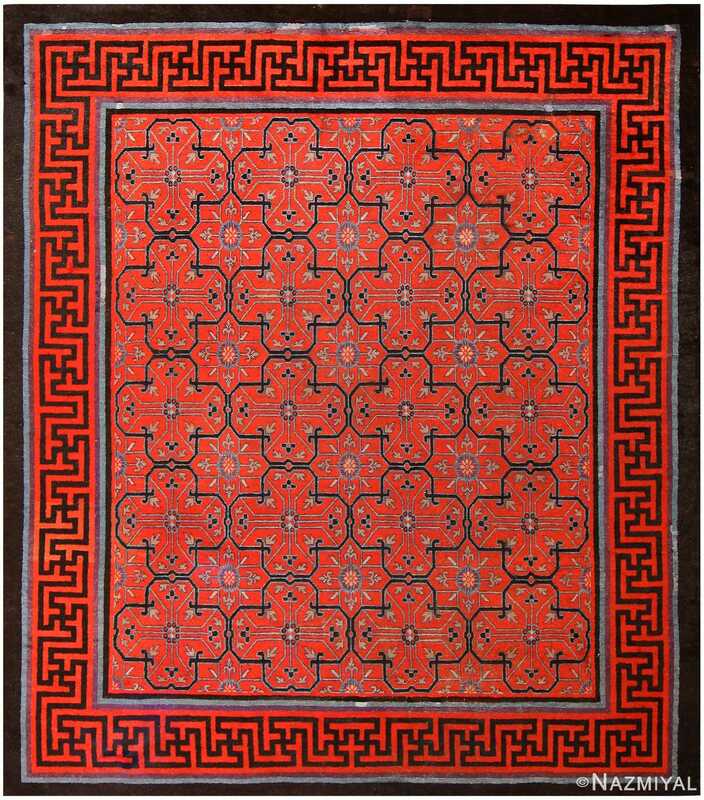 This is a carefully created carpet that embodies centuries of culture, legends, and traditions and perfectly embodies the open and balanced designs of Ningxia rugs. Close up image of largest dragon in Ningxia carpet by Nazmiyal Antique Rugs. A close up of the middle medallion where the largest dragon faces the viewer. Stunning and magnificent, the dragon guards the pearl behind his hooked claws. The dark black used for this rug is deep and adds layers to the design. The dragon in ivory seems to pop out, daring viewers to look closer. Take a look at our newest project featuring this exquisite rug in Central Park!